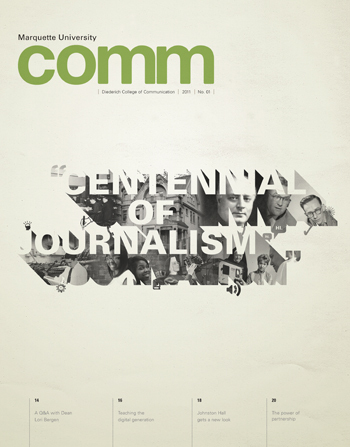 I love getting involved with a project on the ground floor, and that’s exactly what I got to do when I helped the College of Communication create Comm, a new 28-page alumni magazine. 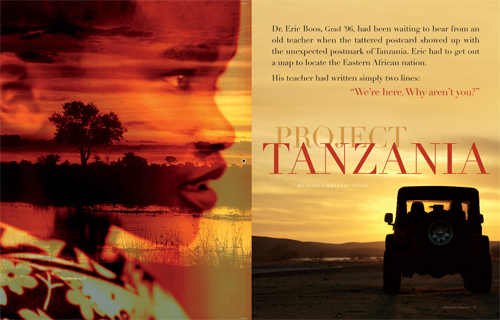 As the project manager, I helped concept the entire publication, wrote some of the stories, edited all the copy and worked closely with the freelance designer. See the PDF. After I took over as editor of this publication, I worked closely with a designer to transform it from a report with bland profile photography to a magazine-style piece with eye-catching illustrations and photos that reflected the research topics. The result was DISCOVER: Marquette University Research and Scholarship, which won a gold award in the Jesuit Advancement Administrators competition and a silver award in the 2008 Pride of CASE V Awards. The CASE judges said: “This annual publication telling the ‘research story’ at Marquette is nicely presented and well written. 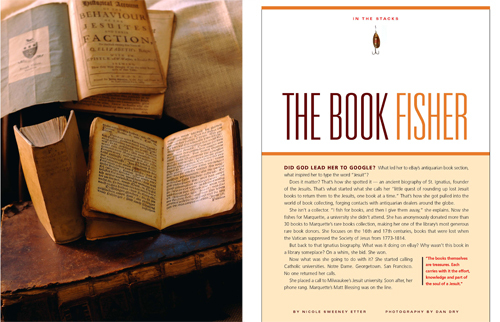 Writing is crisp and sound, and the science is explained well for the lay reader.” See more of the research stories (not all were written by me, but I edited all of the stories from 2007-2013). Although this is an older clip, it remains one of my favorites because it’s quirky and quintessentially Wisconsin. My interest was piqued after the 20-year-old Miss Wisconsin Polka Booster Queen pitched herself for a profile. I soon discovered that she was part of a small (but larger than expected) crowd of 20- and 30-somethings who are determined to keep their grandparents’ favorite music alive. 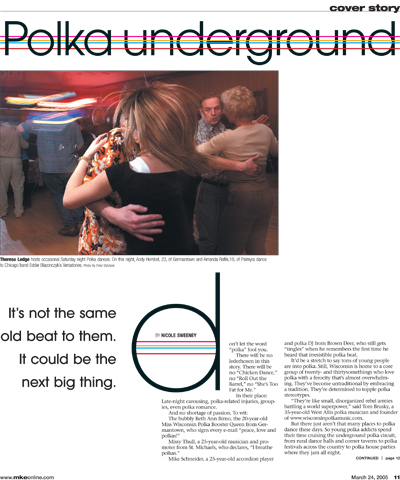 These young polka addicts spend their time cruising the underground polka circuit, from rural dance halls and corner taverns to polka festivals across the country to polka house parties where they jam all night. Who knew? Read the PDF. I ran across a university press release about a recent library acquisition; buried in the release was a mention that the anonymous donor had been collecting Jesuitica and donating the books, one by one, to Marquette’s archives. I had to know more about who she was and what was driving her unusual quest. After some persuading, “the book fisher” told me her fascinating story. Read the story online or see the PDF.